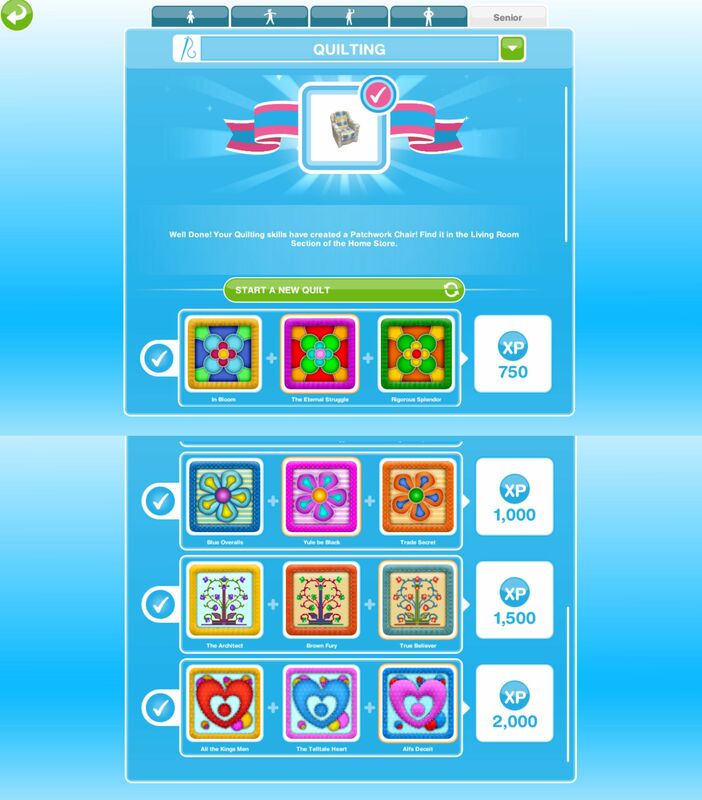 Senior sims can complete the quilting hobby once you complete the In Stitches Quest. Once you complete this quest to begin this hobby you need to buy the quilting kit from the promotions r us store and place it in one of your sims houses. I cannot place the quilting kit, it says its locked/ limited item, what do I do? You will have this problem if you try and place it from the new items tab, look in your inventory instead to be able to place the quilting kit in one of your sims houses. After the time has passed come back and click the exclamation mark above your sims head to find one of the quilt collectibles. Every time your senior sim works on their quilt their quilting hobby skill level up percentage will increase, once you reach 100% you will level up, there are 6 levels. You need to reach level 6 to be able to unlock all of the quilting collectibles, once unlocked you will be able to find them. For example you would need to work on the quilt twice to reach level 3. The Needle Master The Telltale Heart and Alfs Deceit are now unlocked in the hobby collection. Like The Girl Who Games on Facebook!